Pixar, for the second year in a row, has made it into the Best Picture Nominees with an animated film, Toy Story 3. This is now only the third animated film to ever be nominated for Best Picture. First it was Beauty and The Beast in 1993, and the second time was with Pixar’s Up. The deep and complex story of Toy Story 3 appeals to the academy awards but at the same time, it is still has a simple family friendly story that children love. The duality of the story really shows the level of care and quality Pixar puts into everyone of their films. When announcing a third in the series, it brought fear to many people including myself, but clearly Pixar pulled it off. The story starts with Andy growing up and no longer needing his toys. Very sad moments. Something bought melting to death. I cried. A new little girl. I cried more. Credits. It goes without saying that the advancements of technology are really noticeable with Toy Story 3. 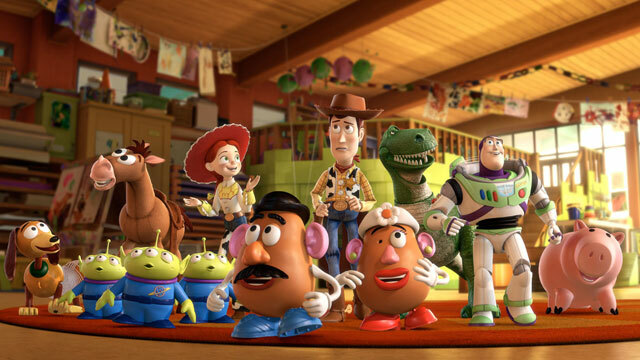 It is very interesting to compare the latest film to Toy Story 1 (1995) and to Toy Story 2 (1999). Each a great distance from each other, that they show good benchmarks of how Computer Generated Images have advanced over time. In the end, Toy Story 3 is a really had film to judge. There are just so many factors to think about. For starters, its the third in a trilogy, with the first two considered two of the greatest films in movie history. I will really need to watch all three again to truly compare. Then you have to compare Toy Story 3 to the award winning collection of Pixar films, not to mention the entire film history of animated films. And now, since its nominated Best Picture, it is compared to nine other live action films. Not matter what way you look at it, Toy Story 3 is a very unique film that is hard to compare too.